Croatia Online ©: Croatia Online - Highlights & Soft Landings? As we get ready for a trip back to the UK it's back breaking work loading up the car with (only the best of) the literature we've accumulated this time round. When we first arrived in Croatia six years ago, there wasn't a lot of information on the web and blogging was as undiscovered as Croatia was. Now it's so much easier to find what you want on the internet but the tourist offices are still big on brochures and information. Sometimes, off season, in the more remote locations you have to dig it out a little but it's worth it and it's a travesty to throw it away until it is properly read and digested. Regular readers therefore have plenty of blogging to look forward to during the UK break, whilst we consolidate the information and catch up on the ones that temporarily got away whilst we were enjoying ourselves too much. Of course there's no substitute for exploring in person and talking to the locals, so we have plenty of notebooks to sift through as well! There have been so many highlights, over the first few months of 2009, of a personal and professional nature, and a number of people who have found the time and made the effort to help us discover more of Croatia and still feel welcome and a small part of it. This is not the place for private or professional thank you's of a general nature but the least we can do is give a plug and a link to some of the websites that belong to those who have made a big difference, and just a short note on some of the things they do that we have seen in the last couple of months! Just a short plug as well for John Nash, co-author of the Croatia Cruising Companion. John runs Marina Facility Solutions from his base in Kaštela and you can read more about his recent successes, in an ongoing campaign to help Croatian Marinas keep the sea clean, by following this link MFS a Key Advisor In Croatia's First Integral Marina Pump Out Solution. To go straight to the latest issue of Euromarina that featured his work at Marina Preko, click here. 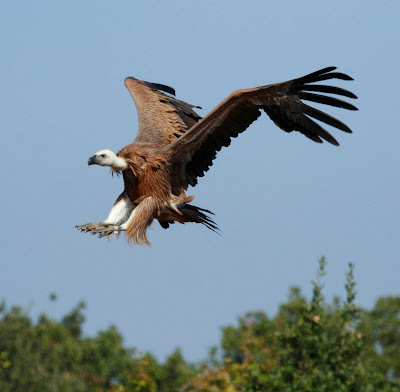 Many thanks to Eko Centar Caput Insulae for today's photo of a Griffon Vulture Landing. Apart from their conservation work with this rare bird, they also arrange bird watching trips too and we'll tell you more about those soon.